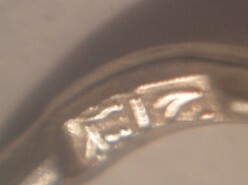 I wonder if anyone can help with this mark which occurs on what I imagine is Indian Silver, but I may be wrong. This is the only mark but stamped on each bit; its a large necklace - the mark is stamped 7 times over all. I suspect Egypt rather than Iraq...definately "800" and it looks like "Cairo" as the assay city to me. Wait and see what AG2012 has to say as he is better at Egyptian silver than me. For what's worth my vote goes to Cairo too, although two little dots are missing/not showing. Thank you everyone, thats so helpful. Sorry for not posting that last one first.